Our Lord would have all His people rich in high and happy thoughts concerning His blessed person. Jesus is not content that His brethren should think poorly of Him; it is His pleasure that His people should be delighted with His beauty. We are not to regard Him as a bare necessity, like bread and water, but as a luxurious delicacy, as a rare and ravishing delight. To this end He has revealed Himself as the "pearl of great price" in its peerless beauty, as the "bundle of myrrh"1 in its refreshing fragrance, as the "rose of Sharon" in its lasting perfume, as the "lily" in its spotless purity. As a help to high thoughts of Christ, remember the estimation that Christ has beyond the skies, where things are measured by the right standard. Think how God esteems the Only Begotten, His unspeakable gift to us. Consider what the angels think of Him, as they count it their highest honor to veil their faces at His feet. Consider what the blood-washed think of Him, as day without night they sing His well-deserved praises. High thoughts of Christ will enable us to act consistently in our relationship with Him. The more loftily we see Christ enthroned, and the more lowly we are when bowing before the foot of the throne, the more truly shall we be prepared to act our part toward Him. Our Lord Jesus desires us to think well of Him, that we may submit cheerfully to His authority. High thoughts of Him increase our love. Love and esteem go together. Therefore, believer, think much of your Master's excellencies. Study Him in His pre-incarnate glory, before He took upon Himself your nature! Think of the mighty love that drew Him from His throne to die upon the cross! Admire Him as He conquers all the powers of hell! See Him risen, crowned, glorified! Bow before Him as the Wonderful, the Counselor, the Mighty God, for only in this way will your love for Him be what it should. True faith is hard. More than mere sentimentalism, faith often calls for a deep and resilient trust in God—especially when the going gets tough and the road is dark. 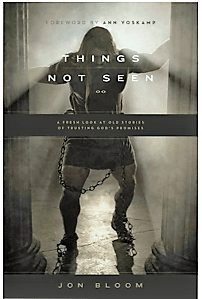 In Things Not Seen, author Jon Bloom encourages readers with 35 imaginative retellings of stories from the Bible that illustrate the importance of living by faith. A follow-up to the author’s previous book, Not by Sight: A Fresh Look at Old Stories of Walking by Faith, this inspiring volume explores the lives of Abraham, Moses, Saul, John the Baptist, and more—helping readers remember God’s promises, rely on his grace, and follow his leading, regardless of the circumstances. Originally published November 05, 2016.